Compact fluorescent light bulbs (CFL) are incredible energy savers. A CFL can save up to 80% in electricity costs and eliminate 400 pounds of greenhouse gas emissions over its lifetime. Compared to standard incandescent light bulbs, they consume far less electricity and last longer while illuminating the same amount of light. Averaging a lifetime of 8,000 hours compared to 750 hours for an incandescent bulb, for the average household, it amounts to five to eight years of use. Large selection of AC and DC CFL Compact Fluorescent Light Bulbs available now at Getics Compact Fluorescent Light Bulbs. Following the rest of the world, the United States is prohibiting the sale of incandescent bulbs in 2012 – 2014. It is deplorable that governments need to regulate something as simple as our choice of light bulbs. It should be completely voluntary. Soon, Americans will have no choice but to replace incandescent light bulbs in their homes and businesses. CFLs are available in alternating current (AC) and direct current (DC). Americans connected to the grid consume AC power. For decades, Americans have gotten accustomed to the round bulb which emits a yellowish tint of white light at a color temperate of 2700K. In stark contrast, CFLs are sold in a variety of beautiful shapes and sizes. CFLs are produced in different color temperature scales referred to as Kelvin (K). They are available in warm white (2700K), soft white (3500K), cool white (4200K) and a bluish-white daylight (6400K). AC CFLs are incredible energy savers but DC powered CFLs are even more energy efficient. They are used for lighting in recreational vehicles and living off the grid. They can work directly from battery power, but it is safer to connect dc lighting to a solar charge controller which is connected to a solar AGM battery. Add a solar panel to generate electricity to recharge the solar AGM battery. While it is true that each CFL contains a trace amount of mercury, they are not hazardous as long as they are handled safely by the base and protected against breakage. Each CFL contains between 3 – 6 milligrams of mercury which is the tip of a ballpoint pen. If a CFL bulb breaks, there are safety procedures that you can put into action to protect yourself and your family. Open windows to allow the mercury vapours to escape, and keep people and pets away for at least fifteen minutes. Once fifteen minutes pass, be sure to wear suitable disposable gloves and a dust mask while cleaning up the bulb fragments. Do not use a vacuum cleaner. Use an old broom, and do not forget to dispose of the gloves, dust mask and broom. It is unlawful to dispose of light bulbs containing mercury along with regular trash. Consult the guidelines published by the local utility company in your community to properly dispose of CFLs. Several large retailers, including Home Depot, accept CFLs for recycling. 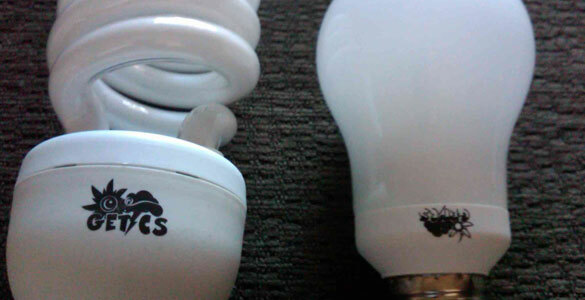 Here are two good arguments against using CFLs. If there is only one 50 watt incandescent bulb operating in your home for one hour per day, it makes no sense to switch to CFLs, especially if you prefer a yellowish tint on everything in the room. Incandescent light bulbs emit 10% light, 90% heat which is an excellent source of radiant heat. Incandescent light bulbs are great for keeping food warm. Nonetheless, if you purchase ten 10 watt CFL bulbs that illuminate the same amount of light operating at one hour per day, it will take years before they need to be replaced. You are definitely making a difference to conserve energy and reducing harmful greenhouse gas emissions. Join the green revolution today. It is completely up to you.